A big thank you to our sponsors: Pizza Pizza, Starbucks, Campus Bubble Tea and Sweets of the Earth for helping us put together a great event! Join the Women Empowerment Club at York University on February 27th, 2016 for our 4th annual conference: Dismantling Systemic Sexism! The conference will take place from 10AM to 5PM at the HNES Building, York University! 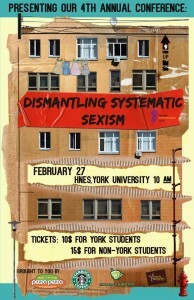 WEC’s 4th Annual Conference, Dismantling Systemic Sexism, will be a full-day conference providing York and non-York students with opportunities to have open discussions about issues that often seem to be non-existent in our society and everyday lives. We hope to have an event around community based social change and inter-sectionality through a diverse collection of workshops in small group settings throughout the day. Delegates can choose their top 3 choices out of the 5 workshops being offered. Islam and Feminism – Outburst! We hope that our delegates will get a chance to learn more about these sensitive issues and discover an open, safe space to voice their opinions and ideas! Breakfast and Lunch will be provided! Plus swag bags and awesome raffle prizes! E-mail wec.yorku@gmail.com for any questions or concerns! Copyright © 2019 Women Empowerment Club at York University. All Rights Reserved.